Mr. Ricardo Glenn, Digital Media Director at Infocus Mekong, looks at measuring reach and frequency in digital advertising. There are two major players in Vietnam at present with respect to digital advertising spend. The Google story began in 1995 at Stanford University in California, when it was founded by Larry Page and Sergey Brin while they were Ph.D. students. In September 1997 they registered the domain name google.com. Facebook, meanwhile, was launched by Mark Zuckerberg and Eduardo Saverin in February 2004, while both were students at Harvard. Today, these two giants capture 25 per cent of the global advertising spend and 61 per cent of global online advertising; figures that are even higher in Vietnam. Media agency Magna forecasts that digital media will take 44 per cent of all ad money spent globally this year and 50 per cent by 2020. Is Vietnam following the global trend? Is Vietnam behaving the same as the rest of the world? Simple answer: NO! TV ad spend is still triple the size of online spend compared to the rest of the world. In many respects, Vietnam mimics the rest of the world in terms of online behavior. As can be seen, the issue is definitely not reach, as Vietnamese are online or on mobiles often. 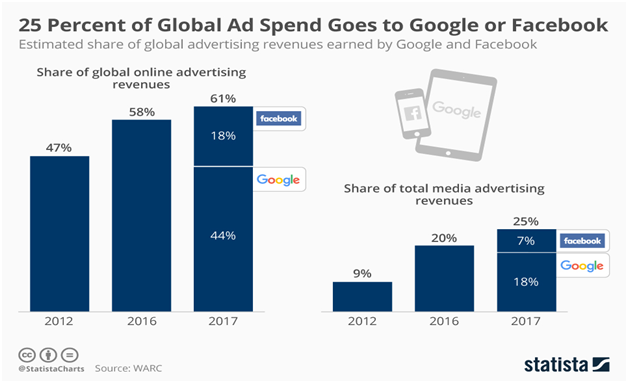 So, what is driving the disparity between online audiences and advertising spend? A simple search for the answer is to look at Vietnam’s northern neighbor, China - today the world’s biggest consumer of digital everything. Back in 2004, China was a mirror image of Vietnam in terms of advertising spend. TV advertising was beginning to lose audiences due to channel fragmentation and the increase of online activities. However, TV had a true and trusted measurement system providing advertisers with reach and frequency (GRP), thus allowing them to better understand their return on investment, which digital did not. Hence, investment was limited on digital because there was no way to understand how impactful this new format of advertising was, making advertisers wary of investing in digital advertising and driving continued spend on TV, even though audience viewership was in decline. In 2009, Miaozhen (China’s digital ad monitoring currency) suggested a more complete and practical way to understand digital advertising, by developing a consistent measurable system between TV and digital advertising using scientific planning, which was based on two key points. After massive data collaboration between Miaozhen, Millward Brown, and Lightspeed, the concept of IGRP was born in China, ahead of the rest of the world. Today, due to Miaozhens’s digital systems, digital spend in China now outweighs TV and is the largest globally. In Vietnam, we are now able to provide advertisers with the same advantages China experienced to drive digital growth. Budget allocation should be placed based on your media objectives, either to gain higher reach or higher frequency. X-Reach software allows you to plot and simulate your desired impact to optimize your overall campaign strategy before you spend any money, by either achieving fixed reach with lower budget or achieving maximum reach within a fixed budget. As witnessed above, Option 4, with a mix of 300 GRP’s on TV and 140 iGRP, can achieve the 50 per cent reach required. Even with a duplication of 8 per cent, meaning you would reach them on both platforms, it gives us the best budget. After understanding how to allocate the money the next step would be to track and understand the performance of your campaign. This chart can help you understand if your objectives were achieved or not. The reach curve of your campaign vs. initial plan or vs. industry should look similar to this.